Bone metastases are a common cause of skeletal morbidity in patients with advanced cancer. The pattern of skeletal morbidity is complex, and the number of skeletal complications is influenced by the duration of survival. Because many patients with cancer die before trial completion, there is a need for survival-adjusted methods to accurately assess the effects of treatment on skeletal morbidity. Recently, a survival-adjusted cumulative mean function model has been generated that can provide an intuitive graphic representation of skeletal morbidity throughout a study. This model was applied to the placebo-control arm of a pamidronate study in patients with malignant bone disease from breast cancer. Analysis by bone lesion location showed that spinal metastases were associated with the highest cumulative mean incidence of skeletal-related events (SREs), followed by chest and pelvic metastases. Metastases located in the extremities were associated with an intermediate incidence of SREs, and those in the skull were associated with the lowest incidence of SREs. Application of this model to data from the placebo arm of this trial revealed important insight into the natural history of skeletal morbidity in patients with bone metastases. Based on these observations, treatment for the prevention of SREs is warranted regardless of lesion location except for metastases on the skull. Insight into the natural course of metastatic bone disease could be enhanced by robust analyses for determining the risk for SREs based on lesion sites. However, such analyses are lacking. The placebo arm of a phase III pamidronate registration study provides an opportunity to investigate the natural history of skeletal morbidity in patients with breast cancer This trial is the largest database of patients with bone metastases from breast cancer who received placebo. The data from this study can serve to illustrate the complicated patterns of skeletal morbidity in patients with advanced breast cancer and provide a rich database for testing the newer statistical methodology for assessing skeletal morbidity, such as random-effects models. This methodology can accommodate variations in event rates between patients, in contrast with previous methodologies, which underestimated data variability and could thereby inflate false-positive errors in treatment comparisons The analyses presented herein assessed the potential prognostic significance of multiple variables including age, location of metastases, and pain to determine survival and SREs. In addition, the relationship of lesion site with risk for SREs was assessed to provide insight on the risk for SREs in patients with advanced cancer. An exploratory analysis was performed using data from the placebo-control arm of a 2-year, randomized, controlled trial of pamidronate for the prevention of skeletal morbidity in patients with bone metastases from breast cancer who were receiving cytotoxic chemotherapy. Patients were enrolled from January 1991 through March 1994, and trial results were published in December 1996 The rationale for the trial size was based on SRE prevention by pamidronate versus placebo and has been previously described Briefly, patients with stage IV breast cancer who had at least 1 osteolytic bone metastasis were stratified by Eastern Cooperative Oncology Group (ECOG) performance status and then randomized to receive either pamidronate 90 mg (via 2-hour infusion) or placebo every 3 to 4 weeks for 1 year. Patients who completed 1 year on study were allowed to continue on study for an additional 1 year of therapy. The primary endpoint was the time to first SRE, including pathologic fracture, spinal cord compression, and the requirement for surgery or radiation therapy to bone. Secondary endpoints included incidence of SREs, change in bone pain and performance status, and overall survival. All SREs were included in the current analysis, in contrast with the original study report in which a 21-day window between on-study SREs was used. Lesion sites were assigned for bone metastases on the basis of anatomic criteria: the pelvis included any non-spinal lesion visible on a standard pelvic radiograph (including the approximate top one third of the femur), the skull included any lesion on the skull including the jaw, the chest included any lesions on the chest, rib, or collar bone (excluding the spine), and the extremities included any lesion in a region not described by the other sites (eg, the arms, lower legs, hands, and feet). The locations of SRE sites were determined by review of medical records, which was necessary because of the presence of multiple bone lesion sites in most patients. All SREs at each respective site were included in the cumulative mean functions, and no event window was applied to the SREs because all SREs contribute to the overall burden of skeletal morbidity, even if they are related events. Although hypercalcemia of malignancy is a clinically important SRE associated with bone metastases, the anatomic site responsible for its cause cannot be specified; therefore, it was not included in the survival-adjusted cumulative mean functions for each lesion site. Bone lesion data were available for all 195 patients in the placebo group. Patient demographic and baseline disease characteristics are shown in Table 1 The skeleton was the only site of metastasis in 60% of patients. Consistent with the fact that no bisphosphonates had yet been approved in this setting at the time, most patients had been diagnosed with bone metastases more than 1 year before study entry, but none had received prior bisphosphonate therapy. Most patients also had bone lesions at multiple anatomic locations. The majority of patients (64%) were found to have bone metastases in the pelvis, spine, and chest (Table 2). SD = Standard deviation, ECOG = Eastern Cooperative Oncology Group, SRE = Skeletal-related event. For overall survival, all of the variables assessed in both univariate and full multivariate analyses and their associated relative risk ratios are shown in Tables 3 and 4. At trial completion, 43% of patients were alive. Hydroxyproline/creatinine ratio (centered) and positive progesterone-receptor status were the only variables to significantly correlate with overall survival in both univariate (p = 0.001 and p = 0.022, respectively) and full multivariate analyses (p = 0.001 and p = 0.050, respectively). The same variables used for overall survival were included in the univariate and full multivariate analyses to assess prognostic factors for experiencing a first SRE (Tables 5 and 6). At trial completion, 56% of patients had experienced at least 1 SRE. Pain scores and prior radiotherapy significantly correlated with risk of first SRE in both univariate (p < 0.001 for all) and full multivariate analyses (p < 0.001 for pain; p = 0.018 for prior radiotherapy). Values in bold represent statistically significant correlations. 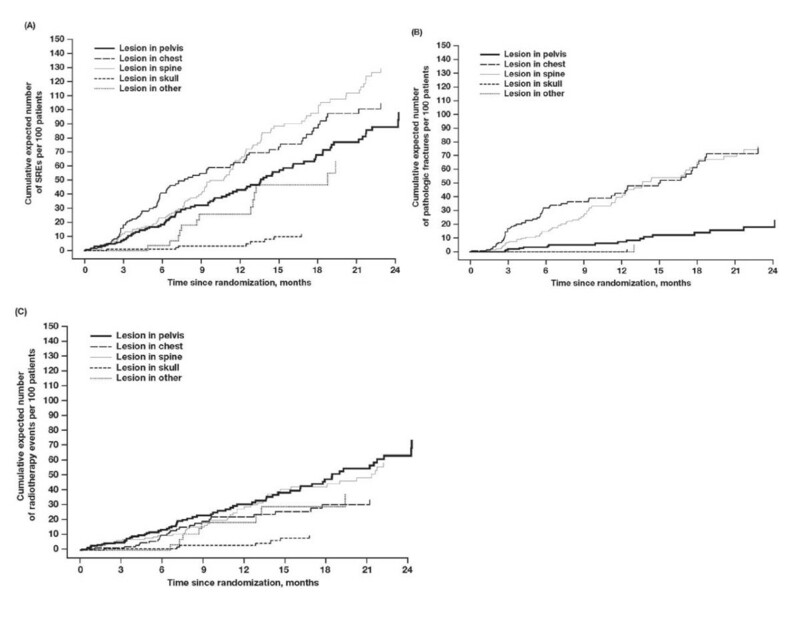 RR = Relative risk, CI = Confidence interval, ECOG = Eastern Cooperative Oncology Group, U = Units. The reduced multivariate models included all significant variables from the multivariate models. For overall survival (Figure 1A), increased time from diagnosis of cancer to study entry, a higher hydroxyproline/creatinine ratio, a history of 2 or more prior hormonal therapies, and the presence of lung metastases significantly correlated with decreased survival duration (p ≤ 0.034) in the reduced model. Increased time from diagnosis of cancer to diagnosis of bone metastases and positive progesterone-receptor status significantly correlated with increased survival (p ≤ 0.011). 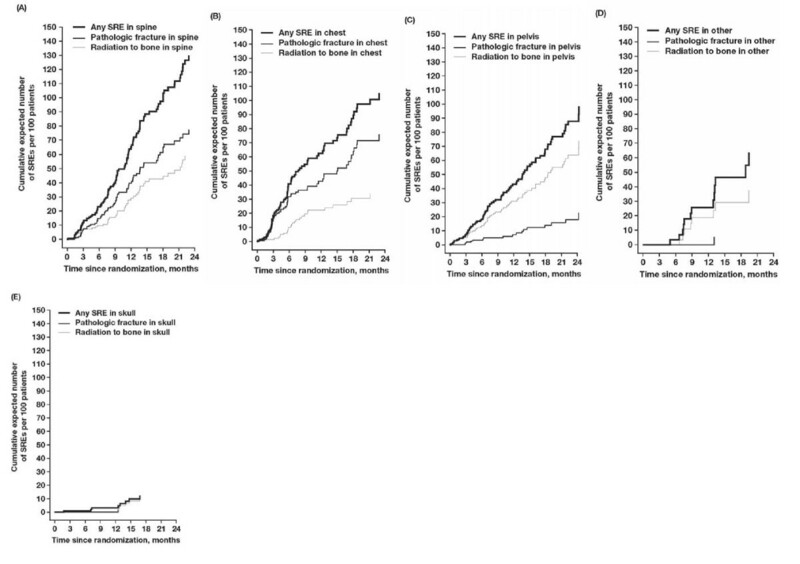 For first SRE, a higher pain score, prior radiotherapy, and the presence of 3 or more osteolytic lesions correlated with a significantly increased risk (p ≤ 0.039; Figure 1B). For pathologic fractures, a higher level of BALP, a higher pain score, and a poorer performance status (ECOG 2 or 3) significantly correlated with increased risk (p ≤ 0.012; Figure 1B). For radiotherapy to bone, a higher pain score and prior radiotherapy correlated with an increased risk (p ≤ 0.010; Figure 1B). 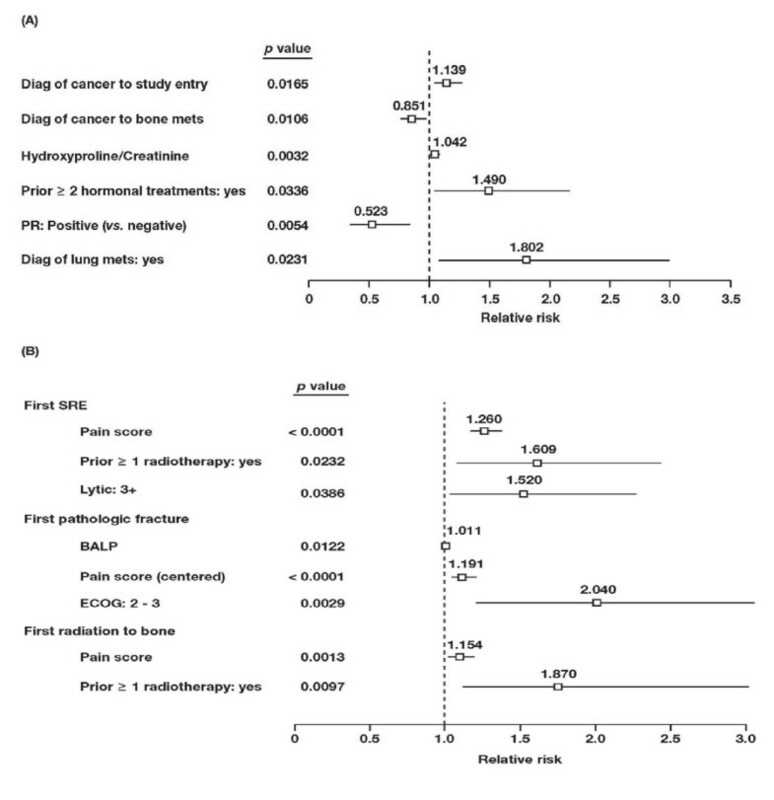 Forest plot of relative risks in patients with bone metastases from breast cancer. Significant covariates for (A) overall survival, (B) first SRE, first pathologic fracture, and first radiation to bone. The relative risk for each covariate was derived from reduced multivariate analyses. Lines represent 95% confidence intervals. PR = Progesterone receptor, SRE = Skeletal-related event, BALP = Bone-specific alkaline phosphatase, ECOG = Eastern Cooperative Oncology Group. Median survival was similar for each of the bone lesion groups and was approximately 15 months. Spinal lesions were associated with the highest incidence of SREs and had a cumulative mean incidence of approximately 0.65 SREs per year (Figure 2A). The most common spinal SREs were palliative radiotherapy and fractures. Thoracic and pelvic lesions were associated with a slightly lower incidence of SREs and had a cumulative mean incidence of approximately 0.50 SREs per year (Figures 2B and 2C, respectively). Lesions located on the extremities were associated with an intermediate incidence of SRE and had a cumulative mean incidence of approximately 0.25 SREs per year (Figure 2D). Lesions located in the skull were associated with the lowest incidence of SREs and had a cumulative mean incidence of < 0.1 SRE per year (Figure 2E). The most common SRE experienced in the skull was the need for radiotherapy. Time course of cumulative mean events of skeletal-related events (SREs) in patients with bone metastases from breast cancer. The incidence of SREs was assessed for patients with (A) spinal lesions, (B) thoracic lesions, (C) pelvic lesions, (D) lesions of the extremities, or (E) skull lesions. The incidence of SREs for the overall patient population was determined based on SRE location. 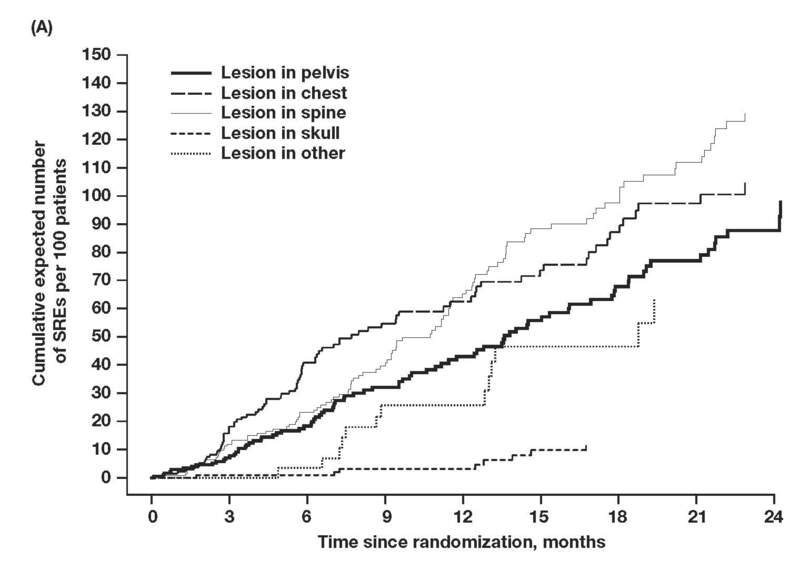 Spinal lesions carried the highest cumulative mean incidence of SREs, followed by lesions in the chest and pelvis (Figure 3A). Lesions in the chest and spine carried the highest cumulative mean incidence of pathologic fractures at these sites, whereas fractures were less common in the pelvis and rare in the skull or extremities (Figure 3B). Although radiation to bone was the most common SRE for skull lesions, the overall incidence of radiation to bone in the skull was lowest. The incidence of radiation to bone was highest for pelvic and spinal lesions (Figure 3C). Time course of survival-adjusted cumulative mean function of skeletal-related events (SREs) in patients with bone metastases from breast cancer. Lesion locations were determined for patients with (A) any SRE, (B) pathologic fractures, and (C) radiation to bone. The development of bone metastases is common in many advanced cancers including cancers of the breast, prostate, and lung After diagnosis of bone metastases, the median survival varies among different tumor types but can be measured in months for patients with advanced lung cancer or years for patients with advanced breast or prostate cancer. These patients are at long-term risk for developing painful and potentially debilitating SREs that can negatively influence their quality of life and decrease their duration of survival. Patients with metastatic bone disease will generally experience 3 to 4 SREs each year, although the occurrence of these skeletal complications is not regular. Skeletal-related events are known to occur more frequently during periods of disease progression and occur more often in temporal clusters as the cancer becomes more advanced. Obtaining a greater understanding of the natural course of disease progression in patients with metastatic bone disease may help identify patients who are at higher risk for SREs and may benefit the most from bone-directed therapies such as bisphosphonates, or who may require close monitoring and surveillance. Information regarding prognostic indicators for disease progression is currently available for patients with metastatic bone disease. For example, variables including prior SRE, number of lesion sites, the presence of pain, and high levels of bone resorption are known to affect patients' risk for SREs. In the current study, reduced multivariate analyses confirmed that the presence of 3 or more osteolytic lesions correlated with an increased risk for SREs. Moreover, multivariate analyses demonstrated that higher pain scores and prior radiotherapy also correlated with an increased risk for SREs. This exploratory natural history study of bone metastases was limited by the available data and only produced statistical associations between variables. The dataset used in these analyses was from the largest documented placebo-controlled trial of patients with bone metastases from breast cancer. Therefore, the evaluated patients were not a random sample of patients with bone metastases, but the best available patients. Moreover, the multiple comparisons used in this study were not prospectively defined at the time of patient enrollment; therefore, there is inconsistency in the number of patients with available data for each variable. Further prospective studies would be needed to confirm the findings from this study. Such trials are unlikely to be initiated, however, as bisphosphonate treatment of patients with bone metastases is now standard of care and a placebo-controlled trial may be unethical. Although information on prognostic factors for SREs based on baseline disease characteristics is available, data regarding patients' risk for SREs based on the natural course of malignant bone disease are lacking. The data presented herein demonstrate that, in addition to the identified prognostic factors, the complex pattern of skeletal involvement associated with metastatic bone disease is clinically meaningful in determining the risk for SREs. Specifically, the anatomic site of skeletal lesions can provide insight into the risk of skeletal morbidity at the lesion site. For example, patients with pelvic, spinal, and chest lesions can be considered high risk for SREs. These lesions were associated with the highest cumulative mean incidence of SREs per year, with the spine demonstrating the highest risk of SREs. In contrast, lesions on skeletal sites that are not weight-bearing, including the skull and extremities, are associated with fewer SREs. Although the location of skeletal lesions affected the cumulative mean incidence of SREs, it did not appear to affect survival, because the median overall survival was approximately 15 months for all patients regardless of lesion site. However, this analysis is limited by the presence of multiple metastatic sites in the majority of patients, and, while the effects of each lesion site on SRE risk could be evaluated separately by limiting the assessed SREs to those occurring in that lesion site, this type of adjustment could not be made for the survival outcome. Patients with metastatic bone disease are at a long-term risk for SREs that can undermine patients' functional independence. Identifying those patients who may be more susceptible to potentially debilitating SREs may help to optimize bisphosphonate therapy and maintain their quality of life throughout the course of disease. This study indicates that patients with lesions to the pelvis, spine, or chest are at increased risk of SREs, and prior studies demonstrated that patients with an SRE are at increased risk of subsequent SREs Bisphosphonates reduce the risk of SREs in patients with bone lesions from solid tumors or multiple myeloma and provide continuous treatment benefits to patients even after the development of an SRE[7, 20–23] In patients with bone metastases from breast cancer, zoledronic acid reduced the risk of a second SRE by 31% compared with pamidronate (p = 0.045) Moreover, in patients with prostate or lung cancer, zoledronic acid reduced the risk of a second SRE by 40% (p = 0.028) and 31% (p = 0.0009), respectively, compared with placebo[7, 22] The combination of these prior findings and the current results indicates that early and continuous bisphosphonate treatment is necessary to delay time to first SRE and reduce the overall occurrence of SREs. Additionally, these analyses underscore the importance of treating bone lesions, especially for patients with pelvis, spine, or rib lesions, and provide important insight into the natural history of bone disease from advanced cancers. The insights gained from these exploratory analyses and previous studies[11, 16, 24] provide the basis for developing a predictive nomogram for assessing bone morbidity, which we plan to test using the databases from the phase III zoledronic acid clinical trials. Skeletal complications from bone metastases can undermine quality of life and may be life-limiting in patients with advanced cancer. Although metastases can occur throughout the skeleton, some sites may be associated with a higher rate of symptoms. Retrospective analysis of the placebo-controlled arm of a pamidronate study in patients with bone metastases from breast cancer revealed that spinal and chest metastases were associated with the highest risk of SREs. In contrast, metastases located in the skull correlated with the lowest risk of SREs. These results provide insight into the natural history of SREs in patients with bone metastases. Moreover, these findings suggest that patients with bone metastases should be treated with bone-targeted therapies to prevent SREs regardless of lesion location. Funding for statistical analyses and for medical editorial assistance was provided by Novartis Pharmaceuticals Corporation. We thank Carol Sledz, PhD, ProEd Communications, Inc.®, for her medical editorial assistance with this manuscript. P. P. Major has acted as a medical consultant for Novartis Oncology. R. J. Cook has served as a consultant for Novartis. A. Lipton has served on the speakers bureau for Amgen and Novartis; as a consultant for Amgen, Novartis, Merck, Incyte, Monogram Biosciences, Acceleron, and GTX Inc.; as research support for Novartis and Monogram Biosciences, and has given expert testimony for Novartis. M. R. Smith has served as a consultant for Amgen, Merck, and Novartis Oncology and is supported by an NIH Midcareer Clinical Investigator Award (5K24CA121990-02) and research awards from the Prostate Cancer Foundation. E. Terpos has served on an advisory board for Novartis and has received honoraria for participation in Novartis-sponsored satellite symposia. R. E. Coleman has served as a consultant for Novartis, Amgen, and Pfizer; has been a speaker for Novartis, Roche, Pfizer, AstraZeneca, and Amgen; and has received research funding from Novartis and has given expert testimony on their behalf. PPM and RJC were responsible for the design and development of the statistical modeling utilized in this study. PPM examined the records for each patient enrolled in the clinical study and classified the locations of each bone lesion and the sites of each of the skeletal-related events that were reported. RJC performed and verified all of the statistical analyses that were included in this study. AL, MRS, ET, and REC each provided strategic direction and critical input into the interpretation and presentation of the analyses. All authors reviewed at least 2 drafts of the manuscript text and approved the final content of this manuscript.